We regularly showed our cats in TICA, FIFe and GCCF cat shows around the UK and we are now looking forward to showing our beauties in Australia. If you would like to see them on show, please contact us and we'll let you know where they will be touring next! For current details of our show successes please see our blog. Meadow became a Supreme Grand Champion! 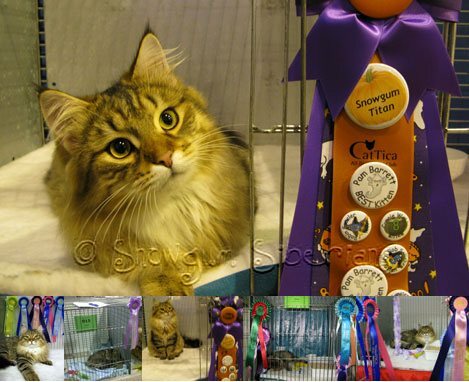 In 2011 Meadow took the UK by storm and became a TICA Supreme Grand Champion in just 3 shows! This is an amazing achievement for a female! 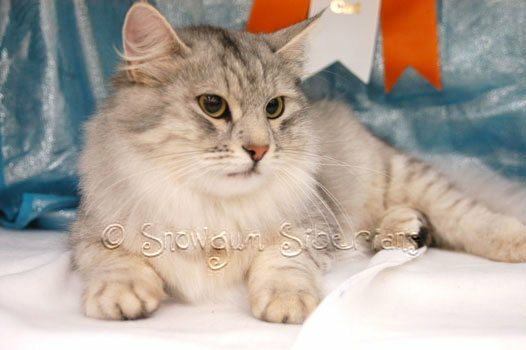 She is the just the 3rd female Siberian to win this award in the UK! Snowgum Spirit became a QGCA In 2010-2011 Snowgum Spirit became a Quadruple Grand Champion Alter! A huge congrats to his owners Darren and Erica and well done Spirit! Meadow won Best of Best at Moscow Show! In May 2011 we travelled to Russia to show Meadow in a huge show in Moscow. She did us proud not only winning Best In Show for her junior age category but going on to win overall Best of Best in the whole show! Indiana became a TICA champion! 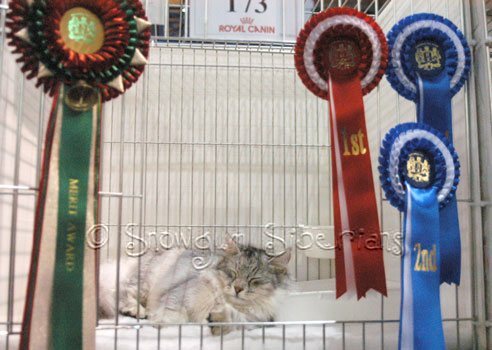 In October 2010 Indiana became a TICA champion winning 3 finals at a TICA show! Delta became a FIFe champion! 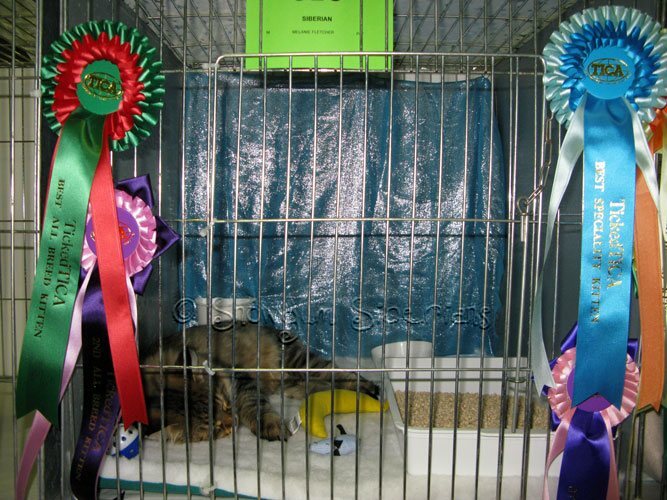 In August 2010 Delta became a FIFe champion and was twice nominated for Best In Show! Snowgum Titan won more TICA Awards of Excellence! 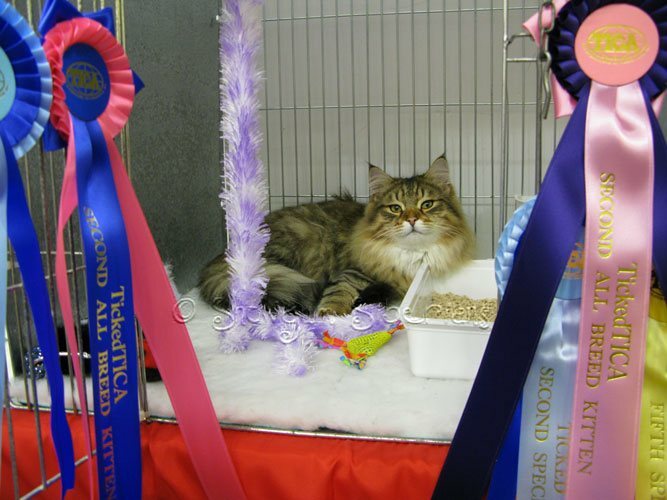 TICA Award of Excellence Best Brown (Black) Mackerel Tabby Siberian Cat in Western Europe 2010, TICA Award of Excellence 3rd Best Brown (Black) Mackerel Tabby Siberian Cat Internationally 2010 & TICA Award of Excellence 2nd Best Siberian in Western Europe 2010! Snowgum Titan becomes a TICA Regional Winner! 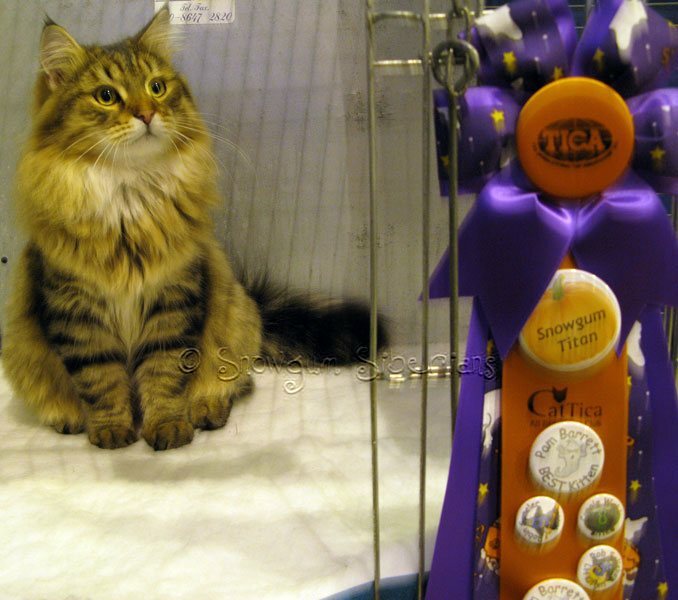 TICA Award of Excellence 20th Best Kitten in Northern Europe 2009 Wow! Well done Mr T! Snowgum Maisie won a TICA Award of Excellence! TICA Award of Excellence- 2nd Best Siberian Alter in Northern Europe 2009! Amazing work Maisie and her owners Darren and Erica! Well done gorgeous girl! Snowgum Titan becomes Supreme- 3rd October 2009! Before hitting 18 months of age Titan achieved the ultimate TICA title of Supreme Grand Champion!!!! Amazing! We are sooooo proud of our handsome man. Well done Mr T! Snowgum Maisie wins QGCA Maisie did brilliantly in her short show career and now holds the prestigious title of Quadruple Grand Champion Alter! This is an amazing achievement especially since the shows really do favour the male Siberians. Well done Maisie, you are a star and we are very proud of you. 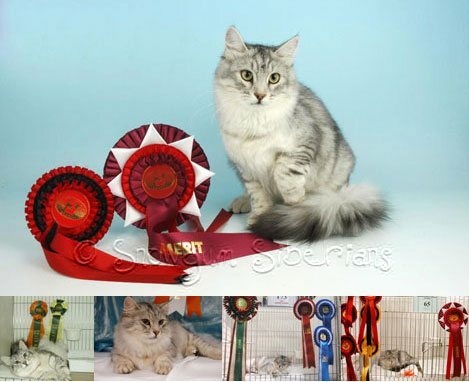 The Viking Cat Club, Rugby 29th November (FIFe),- Titan was awarded EX1 and was Nominated for the Siberian Special final. 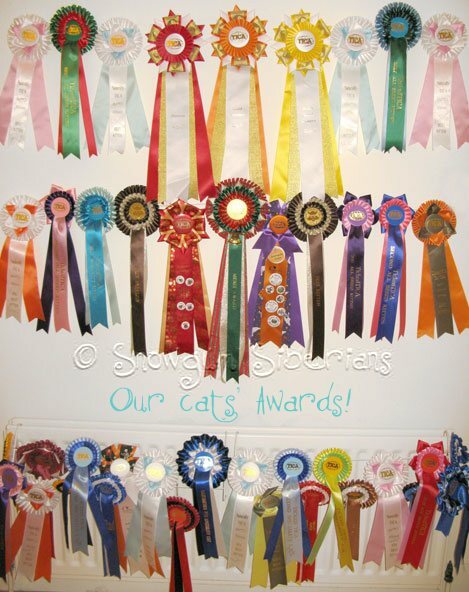 He also won Best Kitten, Best Breeder and 2nd Debutante in the side classes. 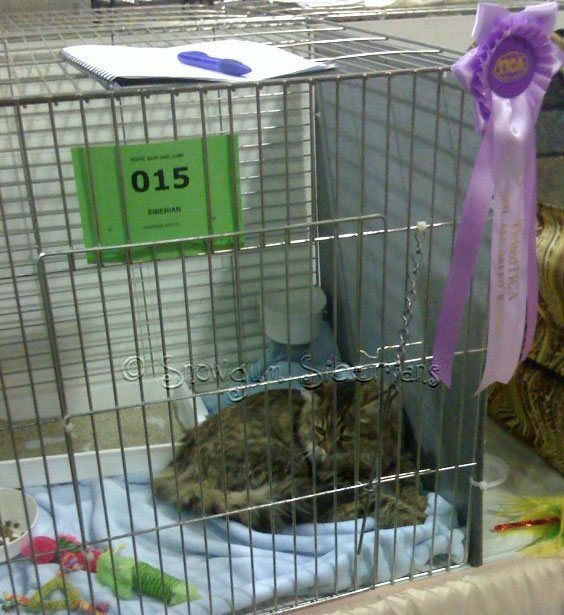 TICA 2007-2008 show season- Frostie was awarded 3rd Best Black Silver Shaded Siberian of the TICA 2007-2008 season world-wide! Wow! Go Frostie! Frostie becomes a TICA Champion!- 27th October 2007 This was Frostie's first show competing as an Adult. 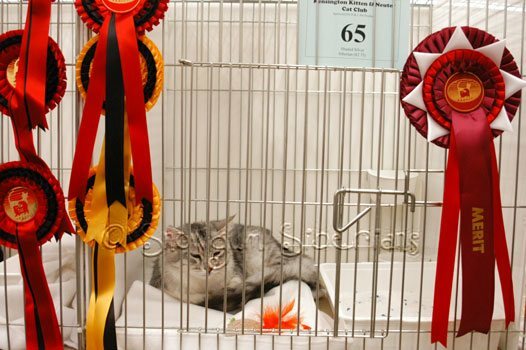 She did really well and made an Allbreed final where she was placed 7th Best Cat! She also collected enough points to be awarded TICA "Champion" status! A brilliant achievement for an 8 month old! Frostie wins Best Kitten!- 8th Septemebr 2007 Frostie did brilliantly at this show being awarded 10th Best Allbreed Kitten by one judge and Best Allbreed Kitten by another! A super effort for her first TICA show.